Smart Buy is an option to save money on jewellery purchase. It is a unique concept, which gives discounts to customers for placing orders for any jewellery design either available with us 'In Stock' or currently 'Out of Stock' but can be manufactured on request. Customers need to plan their jewellery purchases in advance and would require making upfront payment to complete this process. Once order process is completed all 'Smart Buy' products would be manufactured and delivered by promised delivery date. 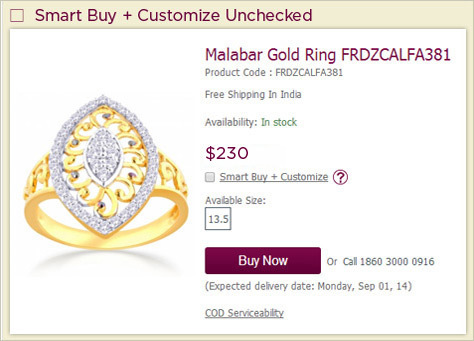 'Smart Buy' option is available on selected products on product detail page. 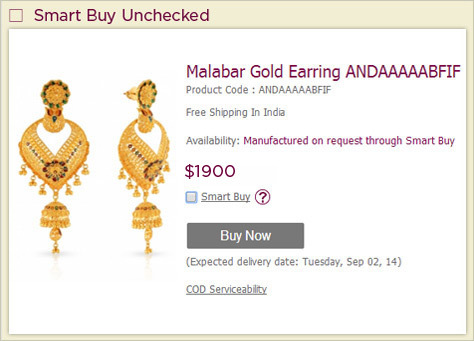 Products like earring, pendant, nosepin, tanmaniya & necklace which does not require sizing will have "Smart Buy' option. Products which can be manufactured in different sizes like ring, bangle, chain, and bracelet will have "Smart Buy + Customize" option in product detail page. 'Smart Buy' gives option to place "Out of Stock" product order online. Products out of availability are manufactured on request through smart buy. 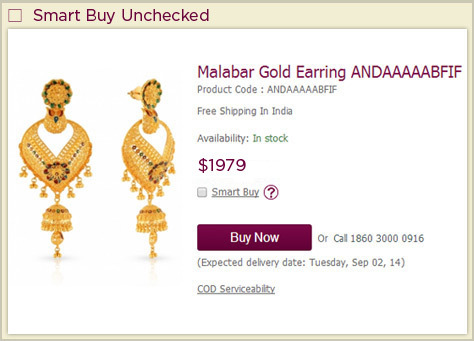 Without the click on 'Smart Buy', an order cannot be placed as we don't have stock of that particular product. 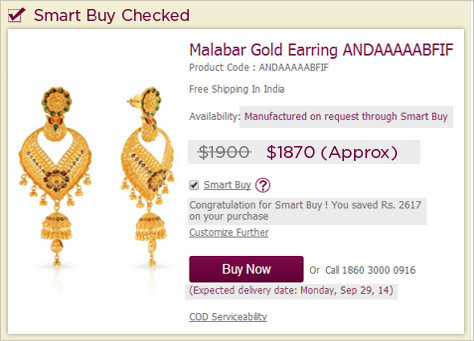 Your order will be processed once you click on 'Smart Buy'. Please note that price mentioned in smart buy products are approximate and final product price may change as per final product weight. Our customer service team will call and inform you about revised weight of product and difference in price in details post manufacturing of the product. Product which can be manufactured in different sizes like ring, bangle, chain, bracelet would have "Smart Buy + Customize" option in product detail page. Since it is not possible for us to keep stock of same design in all possible size, we display price and availability of the size which is currently available in stock with us. If you are looking for different size, click on "Smart Buy + Custmoize" option and we shall manufacture this product in desired size. You can save money for the size required by you without paying extra. Products which can be manufactured in different sizes and are currently 'Out of Stock' with us can be manufactured on request through "Smart Buy + Customize" option. This enables you to customize the size of the product as required and get discount. 1. What does Customize and Smart Buy mean? 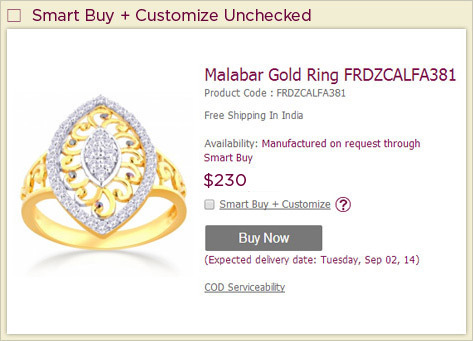 Products such as rings, bangles, chains and bracelet come with Customer and Smart Buy option. This gives flexibility to select sizes as you require and place manufacturing orders. You will also get discounts for these orders. 2. I have seen products marked as 'In stock', stating its availability, but still find Smart Buy option, what does it mean? As we said, smart buy is a unique concept of giving discounts to all products on placing manufacturing orders. For products which are In stock and if you select Smart buy, then the order will go to manufacturing instead of sending you the same product. Delivery date of manufactured products will follow. 3. What are the payment methods accepted? We offer flexible online payment options including credit cards, debit cards, net banking and fund transfer. But we do not accept COD orders for Smart Buy products. 4. Is 14 day return policy applicable to all Smart Buy products? No. Our 14 day return policy is applicable only on products which are ready with us. But in case of manufacturing products, we don't give 14 day return policy. However, if you are not satisfied with our products, then you can return the product at any of our store or online for which our normal buy back policy and exchange policy are applicable. 5. How will I be notified about products manufactured? Once your product is received from manufacturing team, our customer support team will call and inform you the final product price. If the amount paid by you is higher than the final price, we will pay back your excess money and if the amount is higher than what is paid, then we will send you a payment link to complete payment process. 6. Will the final product price change? Yes. There will be a slight difference in the final product price and the amount you paid. This is because; after manufacturing the products, there will be change in weight. Therefore, we will calculate our final product price on the basis of final gold weight, diamond weight, stone weight and gold price booked on the date of purchase and make the charges as per the booking date. 7. Will there be any difference in design manufactured and orders I made? Absolutely No. The final product will be same as you ordered online. 8. What are the applicable discounts I can expect? Discounts vary from products to products and it will be displayed on the product detail page when you select Smart Buy option. 9. Can I use Gift vouchers along with Smart Buy discount? 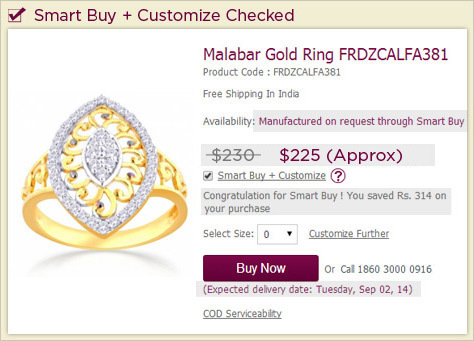 Yes, you can use the Malabar Gold & Diamonds gift voucher along with Smart Buy discount.